Galbe Sánchez-Ventura J, Merino Moína M, Pallás Alonso CR, Rando Diego A, Sánchez Ruiz-Cabello FJ, Colomer Revuelta J, et al. Early detection of developmental disorders (part 1). Rev Pediatr Aten Primaria. 2018;20:73-8. Rodríguez González CT, González Marcos MI, Arroba Basanta ML, Cabello Ballesteros L. Prevalence of attention deficit disorder with hyperactivity in children from an urban area. Rev Pediatr Aten Primaria. 2017;19:311-20. Peñafiel Freire DM, Resano Abarzuza MA, Urriza Yeregui L, Urriza Ripa I, Niyubahwe I, Herranz Aguirre M. Mycobacterium bovis lymphadenitis, an entity to consider. Rev Pediatr Aten Primaria. 2017;19:147-50. Pedreira Massa JL, González de Dios J. Pervasive developmental disorders. Diagnostic evaluation and intervention with scientific evidence criteria for Primary Care pediatricians. Rev Pediatr Aten Primaria. 2017;19:e93-e102. Martínez Campos L, Albañil Ballesteros R, de la Flor Bru J, Piñeiro Pérez R, Cervera J, Baquero Artigao F, et al. Consensus document on the aetiology, diagnosis and treatment of sinusitis. Rev Pediatr Aten Primaria. 2013;15:203-18. Prada Ojeda A, Otón Sánchez MT. Rheumatic diseases in children: key features to recognize in Primary Care. Rev Pediatr Aten Primaria. 2013;15:275-81. 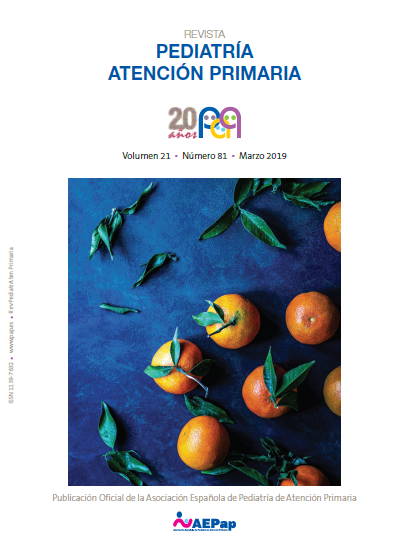 Ortiz Soto P, Duelo Marcos M, Escribano Ceruelo E. The psychiatric interview to children and adolescents (II): Psycho-affective and cognitive development of the child. Rev Pediatr Aten Primaria. 2013;15:89.e41-e55. Pérez Payá A., Lizondo Escuder A, García López C, Silgo Gauche E. Attention Deficit Hyperactivity Disorder from the point of view of the primary care pediatrician. Rev Pediatr Aten Primaria. 2012;14:225-9. Carabaño Aguado I, La Orden Izquierdo E, Pelayo Baeza FJ, Gallardo Madueño G. Crying, irritability and right abdominal mass are not always synonyms of intussusception. Rev Pediatr Aten Primaria. 2011;13:595-600. Ortiz Soto P, Duelo Marcos M, Escribano Ceruelo E. The psychiatric interview to children and adolescents. Rev Pediatr Aten Primaria. 2011;13:645-60. Martínez García MS, Casado Sánchez ML. Cystic fibrosis, a diagnosis at Primary Care. Rev Pediatr Aten Primaria. 2011;13:83-8. Bofill Moscardó I, Fernández Corchero A, Villegas Briz MA, García del Moral A, Hijano Bandera F. Child Psychiatry: prevalent conditions in Primary care, approach and treatment. Rev Pediatr Aten Primaria. 2010;12(Supl 19):s93-s106. Andreu Alapont E, Lacruz Pérez L, López Montesinos B, Calvo Penadés I. How do we diagnose and treat a pediatric rheumatic disease: interactive cases report. Rev Pediatr Aten Primaria. 2010;12(Supl 19):s191-s200. What if someone consult us because they wet the bed? Úbeda Sansano MI, Martínez García R. What if someone consult us because they wet the bed? Rev Pediatr Aten Primaria. 2010;12(Supl 19):s231-s243. Malaria in the world in 2010: What’s new about this old scourge? Lanaspa M, Renom R, Bassat Orellana Q. Malaria in the world in 2010: What’s new about this old scourge? Rev Pediatr Aten Primaria. 2010;12:685-700. Elías Pollina J. Visual diagnosis in childhood surgical disease. Rev Pediatr Aten Primaria. 2009;11 (Supl 17):s349-358. Ruiz-Lázaro PM, Posada de la Paz M, Hijano Bandera F. Autistic spectrum disorders. Early detection, screening tools. Rev Pediatr Aten Primaria. 2009;11 (Supl 17):s381-397. Children with febrile seizures, have to be treated with anticonvulsivants when they have fever? Aparicio Rodrigo M, Sánchez Andrade R, González Rodríguez MP. Children with febrile seizures, have to be treated with anticonvulsivants when they have fever? Rev Pediatr Aten Primaria. 2009;11:145-54. Marugán de Miguelsanz JM. Clinical diagnosis and screening of celiac disease. Rev Pediatr Aten Primaria. 2008;10 Supl 2:S29-38. Jiménez Alés R. Interpretation of laboratory test in Primary Care Paediatrics. Rev Pediatr Aten Primaria. 2008;10 Supl 2:S111-9. Juanes de Toledo B, Ruiz-Canela Cáceres J. Diagnosis: apendicitis. Rev Pediatr Aten Primaria. 2008;10 Supl 1:S121-4. Caretti Giangaspro E, Alcamí Pertejo M. Instruments for the early detection of the autistic spectrum disorders. Rev Pediatr Aten Primaria. 2007;9: 301-15. Mora Gandarillas I, Castillo Laita JA, Díaz Vázquez CA. Workshop on allergy diagnosis. Rev Pediatr Aten Primaria. 2007;9 Supl 2:S129-33. What to do in the presence of a heart murmur in an asymptomatic child? González Rodríguez MP, González de Dios J, Buñuel Álvarez JC. What to do in the presence of a heart murmur in an asymptomatic child? Rev Pediatr Aten Primaria. 2006;8:659-70. Fernández Pérez M, López Benito MM. Attention-Deficit/Hyperactivity Disorder: evaluation at the pediatric office. Rev Pediatr Aten Primaria. 2006;8 Supl 4:S11-24. Bassat Orellana Q, Guinovart Florensa C, Alonso Fernández PL. Malaria in the world. What needs to know a paediatrician? (II): diagnosis, prevention and treatment. Rev Pediatr Aten Primaria. 2006;8:139-155. Castillo Laita JA, Pardos Martínez C, Callén Blecua MT, Carvajal Urueña I. Basic diagnostic evaluation in the asthmatic child and adolescent in Primary Care. Rev Pediatr Aten Primaria. 2005;7 Supl 2:S29-47. Junyent Priu M, García García JJ, Pou Fernández J. Child maltreatment: detection and intervention. Rev Pediatr Aten Primaria. 2004;6:433-441. Úbeda Sansano MI, Rico Marí E, Martínez García R, Gandía Giménez AM, Chorro Gascó FJ, Díez Domingo J. Adolescent and his/her body image. Hidden factors of confusion in diagnosis. Rev Pediatr Aten Primaria. 2003;5:583-587.